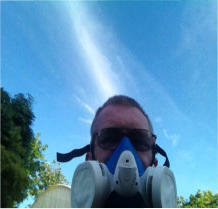 I started doing ChemTrailsUk website due to me always being ill. It all started in 2000 first thing i noticed was i could not get rid of this so called flu. I kept burning up, sweating no air getting to my lungs and bringing up 2ltr bottles full off the thickest Phlegm ever ,every day. One day i was sat in my front room with my girlfriend and my eyes started to roll. This was the start of me passing out through lack off oxygen to my body. I went to the doctors on numerous occasions where he has sent me for x-rays and tests to no avail. In 2010 I had a seizure which was through the Phlegm blocking my airways when i slept. I have had 3 more seizures since then each one as bad as the other. As the years have progressed my Phlegm doesnt look like Phlegm any more it looks more like a clear silicon which is jelly like and hard.